Bethesda, MD, 2018-Oct-05 — /Travel PR News/ — Aloft Hotels, in partnership with Universal Music Group & Brands (UMGB), the brand strategy division of Universal Music Group (UMG), today (10/02/2018) announces the three finalists of the Americas chapter of the global Project: Aloft Star artist discovery competition. The competition from Marriott International’s hotel brand for music lovers and music makers and the accompanying Project: Aloft Star Tour, a five-city international tour of UMG’s emerging artists, is part of Marriott International’s global partnership with UMG, the world leader in music-based entertainment, which has evolved to include a focus on emerging talent. A winner will be chosen from a combination of public votes and the panel of judges’ scores, which includes representatives from UMG, Aloft Hotels and live music discovery platform Bandsintown. From today through October 22, music fans are encouraged to vote for their favorite artist at alofthotels.com. Camden is an American piano player, singer, and songwriter within the electronic pop/soul genre. His most recent release, ‘Friend’ combines moody electronic pop vibes with syncopated dance rhythms. Camden, having grown up heavily influenced by jazz and soul, is currently working on new music that combines those genres with ambient electronic sounds. Camden is also noted for his innate songwriting ability which has put him in rooms with international pop artists and DJ’s alike. His original single ‘Grow Old With Me – Stripped Version’ keeps climbing after exceeding 235,000 streams on Spotify. After their spot on the Vans Warped Tour, and seeing their music featured in television shows (MTV’s Are You The One?, The Only Way is Essex), and video games (Rock Band 4), The Eiffels return with the same diabolically catchy hooks and an even bigger sound. The week of its release, their debut EP was hailed by Baeble Music as an ‘opening salvo that any band would dream of’ and was the 15th most added record on U.S. college radio. They’ve since seen spins from major radio stations like Los Angeles’ KROQ and KLOS, and San Diego’s 91X and Z90. “We’re proud to partner with Aloft Hotels on this endeavor to discover fresh new musical acts while giving our existing emerging artists the opportunity to reach new fans across the country through the Project: Aloft Star Tour. We look forward to having the opportunity to work with the Project: Aloft Star winner,” said Mike Tunnicliffe, EVP Business Development & Brand Partnerships, UMG. 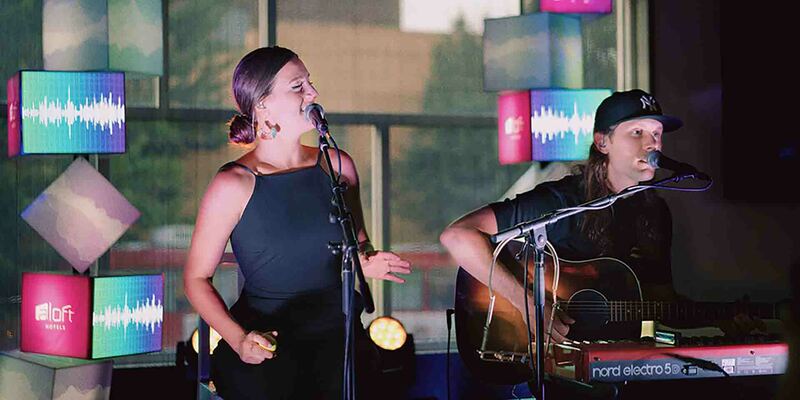 To inspire emerging talent to enter this year’s competition, Aloft Hotels has been taking some of UMG’s hottest breakthrough artists on the road, hitting some of the great music cities to host intimate music performances in the brand’s signature W XYZ® bars. The free performances kicked off with Years & Years in Philadelphia on June 23, and continued in four other locations, including Tank & the Bangas in New Orleans on August 9, Bea Miller in Asheville on August 21, Stanaj and Fátima Pinto in Costa Rica on September 14 and BANNΞRS in Denver on October 17. At each tour stop, fans are able to collect an exclusive custom memento poster featuring art created by New York designer and illustrator Sophia Chang. While the tour is open to everyone to join, the best way to experience it is as a member of Marriott’s award-winning loyalty programs Starwood Preferred Guest (SPG) and Marriott Rewards. Special member benefits include artist meet and greets and destination packages, available for redemption with Starpoints and Marriott Rewards points through SPG Moments and Marriott Rewards Moments. This entry was posted in Entertainment, Festivals and Events, Hotels, Luxury, Resorts, Travel, Travelers and tagged Aloft Hotels, competition, finalists, Marriott International, Mike Tunnicliffe, Star artist, Toni Stoeckl. Bookmark the permalink.